Rennes is a beautiful city with lots to offer. "The most liveable city in France", according to L'Express, a weekly French magazine, it has everything from its ancient roots as a major city of art and history in the Duchy of Brittany, to its presence today as a digital innovation centre in France. There is plenty to do here including walking along the festive, cobbled street of Drinker's Alley, swimming in the historic Saint George's swimming pool, eating delicous fish or crepes at one of the local restaurants, enjoying a craft beer at an Irish pub, or stopping to smell the flowers at one of the 856 hectares of green space found in the city. 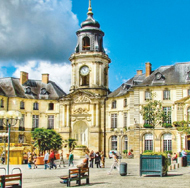 Please check the Rennes tourist site for more ideas and a Top 10 Must-See List.